Who Funds Mugabes' Lavish Lifestyles? 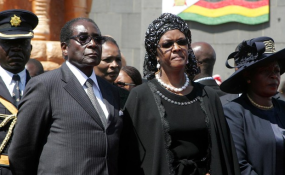 President Robert Mugabe and his wife, Grace (file photo). The Congress of South African Trade Unions (Cosatu) Tuesday urged a travel ban against Grace Mugabe who was last week allowed to escape assault charges against a South African model by the Jacob Zuma led government. Grace flew into a rage at a Sandton Hotel over a week ago and attacked a 20 year-old woman widely reported to be friends with the first couple's socialite two sons based in South Africa. Images of the beauty showing deep cuts on her head were flashed to the entire world, igniting global calls for Zimbabwe's larger than life first lady to face the music. But amid clamours for justice and with Grace seemingly resigned to her fate while still holed up in South Africa for a week, authorities in the rich southern neighbour finally braved public anger by granting diplomatic immunity to her. South Africa's Department of International Relations Minister Maite Nkoana-Mashabane later defended the decision citing the need to maintain Pretoria's diplomatic relations with Harare and to prevent the incident from casting a shadow over the SADC summit which almost coincided with the case. Meanwhile, citizens from both South Africa and Zimbabwe have chorused their disapproval on what they find to be the protection of a powerful elite at the expense of the vulnerable majority. Cosatu, likewise, released a damning statement urging South African authorities to impose a travel embargo on President Mugabe's controversial wife. "This (immunity) makes a mockery of our rule of law and the principle of equality before the law," said the workers group in a statement issued by its spokesperson, Sizwe Pamla. The vocal workers group said the granting of diplomatic immunity to President Mugabe's wife was "disgraceful and camouflaged surrender". "It is clear now that the citizens of this country cannot be guaranteed protection by this government. "This ill thought decision is proof that our so called exceptionalism is an amount of scale, not of quality anymore." Pamla added: "While we agree that government has every right to maintain healthy relations with our neighbouring countries but this should not be done at the expense of South African citizens. "We cannot allow the political anarchy and vandalism of the Mugabe led administration in Zimbabwe to be imported into our country. "Ms Grace should be banned from ever coming into this country. Our government's camouflaged surrender and cowardice is shameful. We are turning into a Banana republic very fast because of our government's misdirected idealism." President Mugabe, Grace and government spokespersons have not yet publicly commented about the embarrassing incident. The Grace debacle has drawn wide condemnation even from eminent citizens from both countries, among them former African Union Commission chair and ANC stalwart Nkosazana Dlamini-Zuma as well as South Africa's former Public Protector Thuli Madonsela who has said President Mugabe should swallow his pride and apologise on his wife's behalf. Zimbabwe's opposition has also deplored the incident while assuring their neighbours that Grace's conduct was not reflective of the conduct of all citizens north of the Limpopo.